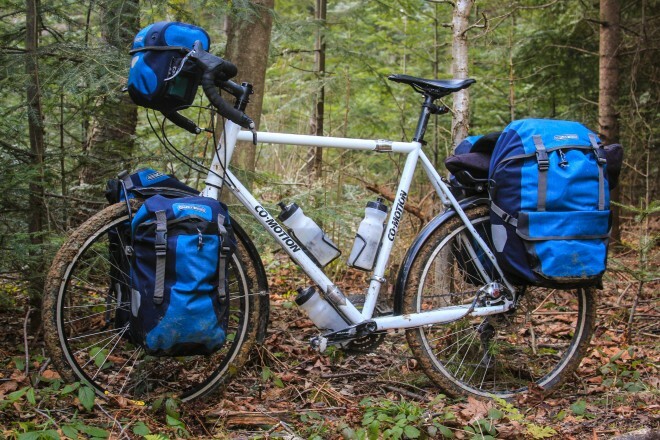 What are the best Ortlieb panniers for touring? Well, I’ve been bicycle touring around the world for the last 16+ years and I’ve used a number of different pannier brands during that time. For the last 10+ years, however, Ortlieb panniers have been my bicycle pannier brand of choice! Why is that exactly? Well, I already wrote a detailed review of what I believe to be the best Ortlieb panniers for touring, so I’m not going to rehash that same information in this article. 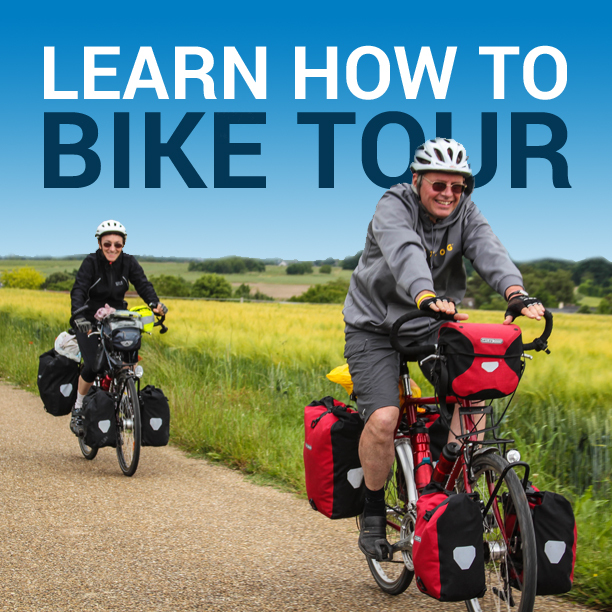 Instead, I’d like to take a moment and share with you some of the photos from my 2015 bike tour in Europe… in which you can see my new denim blue Ortlieb panniers being used in various countries all across the continent. You will note that these new panniers are denim blue, and not red, like the ones you may have seen in my previous Ortlieb pannier review. I hope these photos inspire you in some way to get out there and conduct your own bicycle touring adventures. At the very least, you’ll be able to see how the blue panniers look in comparison to the red ones I’ve reviewed in the past. These Ortlieb panniers for touring are available in a variety of colors and can be purchased from the following online retailers: REI, CycloCamping and Amazon. What do you think of the denim blue Ortlieb bicycle panniers pictured on this page? Do you like the blue panniers pictured here? Or the red ones featured in my previous Ortlieb panniers review? Leave a comment below and let me know what you think! WHERE TO BUY? – These Ortlieb panniers are available in a variety of colors and can be purchased from the following online retailers: REI, CycloCamping and Amazon. This entry was posted in Bicycle Touring Pro Articles, Featured Articles, Main Articles, Panniers, Product & Service Reviews, Products and tagged bike packer plus, ortlieb, ortlieb bike packer, ortlieb handlebar bag, ortlieb panniers, ortlieb panniers for touring, ortlieb sport packer, ortlieb waterproof panniers, sport packer plus, touring bags, touring bicycle panniers, touring panniers, waterproof bags, waterproof bicycle bags, waterproof bike bags, waterproof bike panniers, waterproof panniers. Would like to see a behind-the-scenes post on how you get these shots of yourself. Some are fairly obvious, put camera on ‘tripod’ with timer, but some look like you would need help with, like the timing of the 8th shot down (you on the bike, lake behind, camera up on a rock). Did you have a friend take this? Would be very difficult to time this otherwise. All of these photos are actually shot with the camera on a tripod and a 10-second timer. Hi Darren. They look good. Better than the red I think. I know you are sold on Ortlieb. However, I’ve heard it said that one problem with truly waterproof panniers is that they don’t breath, and that condensation can occur in the bags, creating mildew. If water gets in, in can’t get out, goes the theory. In practice, do you deal with this? Is this one real tradeoff between a pannier that is not waterproof and one that is? That’s true John… and that is a problem with the roll-top Ortlieb panniers… which is why I don’t use those. Instead, I use the Plus panniers from Ortlieb, which are 100% waterproof from falling rain and snow, but are not 100% waterproof (as if dropped in a lake or river). My Ortlieb Bike-Packer and Sport-Packer Plus panniers (which I prefer to the Classic roll-top panniers) are open at the top and can breathe – so they don’t have the issue with condensation that you bring up. The blue Ortleibs look good. I have the identical set in red. My thinking was that red might provide a bit more visibility. I have not used them yet, but plan to this spring and summer. Thank you for your insights and sharing your experiences. You are livin’ the dream, IMO! I don’t really have a preference for either the red or blue panniers, although the red probably look more photogenic. My concern would be the red or blue panniers might give away a stealth camping site since they don’t naturally blend in. Also noticed your change from a green to an orange tent, too. Just wondering about the stealth camping aspect. I picked the Lime/Moss Green rollers myself. The green matches my bike, though color is a personal thing. I picked rollers, partly to save a few bucks, partly as they are a pound or so lighter, and partly because they are simpler. As for visibility, that’s part of why I picked the green, thought in reality, the most visible color on Ortlieb bags seems to face to the side, when I’d prefer it be what is seen from the front and back so cars coming from behind would better see me.